Universal City, CA, USA (February 17, 2015) – The spotlight shines brightly on Universal Studios Hollywood as the world-class destination celebrates a milestone 50th anniversary with the much-anticipated opening of the “Fast & Furious—Supercharged” thrill ride, “Springfield,” an-all new immersive experience surrounding “The Simpsons Ride,” and a “Nighttime Studio Tour” as part of the theme park’s pioneering epic transformation. This huge undertaking – the most ambitious in the theme park’s storied 50-year history – will radically alter and reimagine its familiar footprint as The Entertainment Capital of L.A. sets its sights on the next 50 years. Since its inception, Universal Studios has lifted the veil on Hollywood’s most illustrious industry, placing guests at the heart of favorite movies and television shows. It continues to be at the forefront of innovation, imagination and inspiration, working in collaboration with some of the most influential filmmakers in the business and the greatest minds in entertainment – Steven Spielberg, Matt Groening, James L. Brooks, Peter Jackson, Michael Bay and Chris Meledandri – to create intriguing rides and attractions. 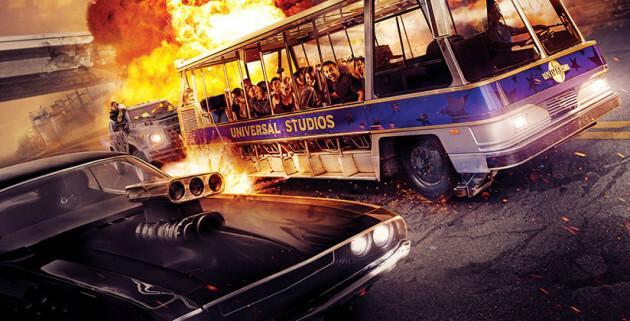 This gripping, technologically-advanced ride, inspired by Universal Pictures’ most successful film franchise of all time and featuring the film’s original cast members, will propel guests into the high-stakes underground world of fast cars and daring escapades traveling at accelerated speeds of up to 120 miles per hour. Situated within a newly constructed 65,000 square foot building on the legendary backlot, the high speed, 3D-HD ride will reunite stars from the Fast & Furious series – Vin Diesel (Dominic “Dom” Toretto), Dwayne Johnson (Luke Hobbs), Michelle Rodriguez (Letty Ortiz), Tyrese Gibson (Roman Pearce) and Luke Evans (Owen Shaw) – in a revolutionary mega-attraction, conceived as a new installment to the dynamic film series that can only be experienced at The Entertainment Capital of L.A. In the spirit of the popular social media trend Throwback Thursdays (#TBT), Universal Studios Hollywood’s Facebook, Twitter, and Instagram will pay tribute to its legacy with a collection of nostalgic photos. Join the conversation and share Universal Studios Hollywood memories using #UniStudios50th and @UniStudios.